In the audio commmentary, Robert Conrad says that the series ended because of the concern that too much violence was being shown on television at the time the 4th season was in progress, this being 1968-1969. Sad, because everytime there is an uproar about something happening on TV, shows are cancelled and then within five years shows are worse than they were. 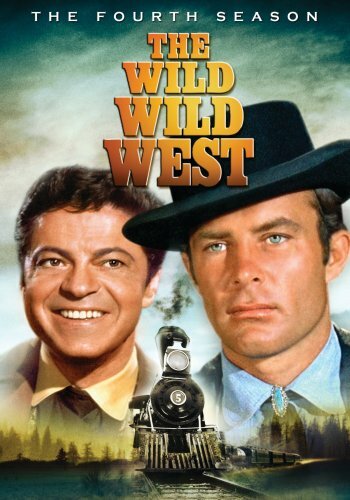 I like the series because I saw it to be differnt from the other westerns that were airing in the mid 1960's. The mainstay of shows were human dramas set in a western US setting. The Wild Wild West was free-for-all approach to a western, blending technology, science, science fiction, the occult, adventure, action, pretty young ladies, humor, and wonderful character portrayals by Ross Martin. All of this wrapped up in a mystery to be unravelled as the show progress. Though I haven't seen every episode of the season, it seems that the shows are starting to lose something compared to Season 1. Some of the props and sets have been reused so much that they are instantly familiar, thus somewhat stale. But the plots continue to be interesting. Two of the most disappointing episodes are TOF Bleak Island and TOF Miguelitos Revenge. Bleak Island was fine except the attempt at the end to turn the story back on itself seemed very corny. Miguelitos Revenge was a very poor last episode for such a clever adversary as Dr. Loveless. The plot lacked the intensity of the earlier Dr. Loveless episodes and became poor attempt to introduce a science fiction element. The absence of Antionette and Voltaire was also disappointing. To properly tie up the Dr. Loveless legacy, I would have expected to see the clever Dr. once again plotting to get control of California, which is what he wanted in his first appearance in Season 1. The fourth season of this great show suffered somewhat from the long absence of Artemus Gordon, due to the actor's health, I believe. The people helping Jim in his stead were okay, but of course there's nothing like Artie and his voices, disguises, accents, and other quirks. As with some of the other 60s shows I've reviewed (ie. Mission Impossible - The Complete First TV Season), I should acknowledge I was born long after this series ended and only caught some brief snippets in re-runs on TBS. But I'm a fan of the 60s spy genre, and decided to give The Wild Wild West a look. This series is great fun, and credit goes to Robert Conrad and Ross Martin for creating great leading characters that have aged fairly well. Conrad plays James West exactly like what you'd want from a James Bond character in the old west - a dash of charm, charisma and authority, and a whole lot of toughness (more on that later). Ross Martin gets to indulge in a parade of interesting disguises and accents - a few of these likely wouldn't be p.c. today, but hey those were the times. Unfortunately Martin suffered a heart attack this year, forcing some fill-in guest agents (including Gilligan's Island star Alan Hale Jr). And last but not least, the action sequences are great. You'll find fights from today's shows may look more brutal and intense at first glance, but that's with a lot of clever photography and editing. In The Wild Wild West, you'll see one-take wide shots with people tossing each other over counters, tabletops, climbing onto 2nd-floor balconies and throwing others off, hurtling from staircases into crates, etc. It's amazing what Robert Conrad and the stunt team pulled off for a weekly TV show. What shows today let their actors take the same amount of risk? The fourth and final season of W3 is every bit as entertaining as the other three. Personally, I was most impressed with the very well thought out action scenes and clever ideas for the "secret gadgets" that were used in the show. Fight scenes are well coordinated and entertaining with the actors actually doing all of their own stunts. The whole series,(including this season), has a guest star list that reads as "whos who" of actors from television at that time. For example: Season four included Alan Hale jr. and a small nod to his role as The Skipper in the beloved Gilligan's Island TV series. The only drawback with the fourth season was that the producers had wanted to make the series more "hip" for the younger crowd by adding a sort of surf music sound to the score. It does not always work and the music is not as good as the scoring of the first two seasons. I have purchased all 4 seasons that have been released of the tv series The Wild, Wild West. I love the show and the stars. They are neatly packaged and easy to view. I am however extremely disappointed in the lack of special features after the first season was released. Mr. Martin and Mr. Conrad deserve better. As someone who has put about 120$ into the DVD's, I deserve better. Shame on the company that is putting these DVD's together. You owe me a special DVD of extras in my opinion.